Mercedes-Benz CLA Performance, Engine, Ride, Handling | What Car? The range starts with a 1.6-litre turbocharged petrol, but unfortunately this feels a bit flat at low revs, being happiest only when worked hard. It's the 2.1-litre diesels that will be the most popular choices. The 134bhp CLA 200 d diesel is likely to chime well with buyers, but we found the engine lacking the low-down grunt of its more powerful brother. The 220 d diesel picks up pace swiftly from low revs but is hamstrung by a slow-witted and jerky seven-speed automatic gearbox. 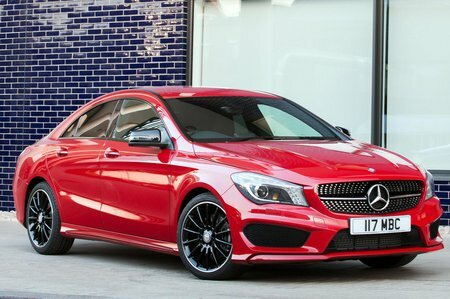 CLA Sport models get 'Comfort’ suspension, while AMG Sport versions have a firmer set-up. The softer suspension is smoother, although the car still shimmies around over poor road surfaces. Sports suspension brings sharper handling but you suffer a choppier ride. Whichever version you choose, the steering weights up nicely as you turn in and there’s plenty of grip. The CLA 45 has bespoke suspension and is great fun to drive but much harder to live with. Surprisingly, and despite the CLA’s streamlined shape, there’s a bit of wind noise down the sides of the car at motorway speeds and a lot of road noise over coarse surfaces. The 220 d’s standard seven-speed automatic gearbox is rather jerky and the engine sounds a bit gruff when you accelerate hard. The petrol is the quieter option, although mechanical vibrations are well suppressed in all the CLA models. The AMG is noisy but in a good way, and it quietens down on a light throttle, provided you avoid the loud (but entertaining) sports exhaust.